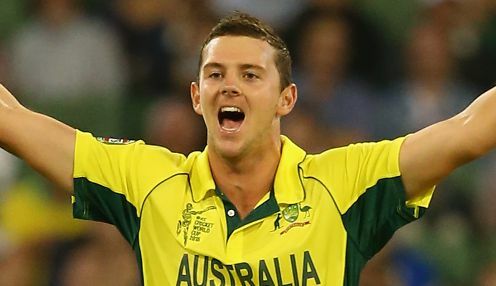 Australia pace bowler Josh Hazlewood believes he will be available for the start of the World Cup, despite being ruled out of the next two series. The 28-year-old is set to have more scans on his back, after suffering a stress fracture during the fourth Test against India. He will miss this month's limited-overs tour of India as well as the subsequent series against Pakistan in the UAE. Hazlewood, though, reckons he will still have enough time to get match fit for Australia's first World Cup game on 1st June. The right-arm quick, who averages 25.15 with the ball in ODI cricket, said: "Everything feels fine, training is coming along nicely, progressing every week. I think we'll just work back from the World Cup actually, and make sure everything is right for that. "We have three (warm-up) games in Brisbane in May against New Zealand, and maybe three when we get over to England. That's six one-day games and quite enough to be ready I think." Coach Justin Langer will also be without left-arm fast bowler Mitchell Starc for the India series while he nurses a pectoral injury. We have three (warm-up) games in Brisbane in May against New Zealand, and maybe three when we get over to England. That's six one-day games and quite enough to be ready I think. Australia hope he will have recovered in time for the limited overs series against Pakistan. Both Steve Smith and David Warner, who will be available for part of that series after their suspensions end on 29th March, are both on the mend from elbow surgery. Langer's team will face England in their first warm-up game in Southampton on 25th May, and take on Sri Lanka at the same venue two days later before they start their campaign proper in Bristol against Afghanistan. Australia are 11/8 to win their first Twenty20 match against India, who are 4/7.